While it is undeniable a bummer to have a two-lap course, the good news is that this is still a beautiful and relatively flat course. Also, you will be able to preview the entire course by running only a quarter of the distance (6.1 miles) if you have a shuttle available. It looks like the course is almost completely off-road – which is great – but there could certainly be some crowding on the 8-foot wide bike path. Incidentally, there is a narrow dirt shoulder for about half of the course, but it is not particularly smooth or level. View of Squaw Valley from the Lake Tahoe Ironman run course. 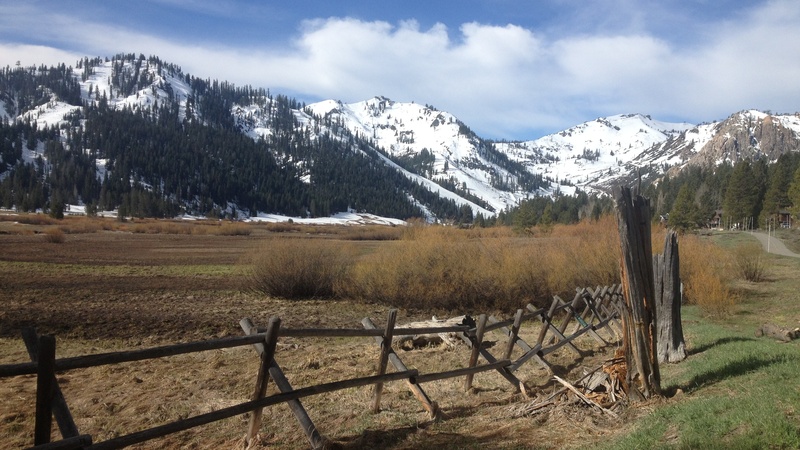 The course will start up in Squaw Valley, cruise down the bike path to Highway 89, then follow the Truckee river most of the way to Tahoe City before turning around to complete the first lap. Athletes will then turn around and do it all over again. Click here for a video preview on Bruce Aldrich’s website, IM Tahoe Live. Click here for a detailed route description and more photos (does not include section from Squaw Valley down to Hwy 89). I don’t have first-hand knowledge of the course route, but I can provide some insight into the existing bike path network. Leaving downhill from Squaw Valley (see driving directions and parking notes below), the bike path is easily found on the right hand side of the road, just after the green “Squaw Valley Meadows” sign. The paved, off-road path gently descends alongside Squaw Valley Rd., and at mile 1.5, it crosses the Squaw Creek Rd. to continue descending. This section goes behind the Squaw Valley fire station, soccer field and park, and pops out at Highway 89 at the bottom of Squaw Valley Rd. at mile 2. From here, the path resumes on the opposite (east) side of 89. Paved path continues for 5 miles to Tahoe City, though the turn around will, of course, be a bit sooner than Tahoe City to make the appropriate mileage for 26.2 divided by 4. By popular request, below is the elevation profile of the bike path from Squaw Valley, down to Highway 89, then onto Tahoe City. This accounts for one quarter of the course – the “out” portion of the two-lap out-and-back course. Elevation profile for the Lake Tahoe Ironman Run Course, first “out” portion only (click to view larger). Ample free parking is available at the Village at Squaw Valley. From Truckee: Drive south on Highway 89 from Truckee for 10 miles. Turn right at the light onto Squaw Valley Rd. Continue up Squaw Valley Rd. until you reach the end (about 2 miles). Turn left into the huge Squaw Valley lot. From Tahoe City: Drive north on Highway 89 from Tahoe City for 5 miles. Turn left at the light onto Squaw Valley Rd. Continue up Squaw Valley Rd. until you reach the end (about 2 miles). Turn left into the huge Squaw Valley lot. As it stands now, there are plenty of runnable dirt trails at 6000′ and below. (The Ritz probably sits around 6500′). The forecast is not great for snow before then, but one never knows. Emigrant Trail north of Truckee is an option for a longer run: http://www.tahoerunco.com/2012/07/run-emigrant-trail/ and Martis Creek is closer to the Ritz, though it might be a bit muddy: http://www.tahoerunco.com/2012/10/run-martis-creek-trail-loop/ You can also run Waddle Ranch, which has a ton of trails, and is just across the road from the Martis Creek loop. You can usually mitigate the mud by going early, while everything is still frozen. Good luck!